Ahead Strap-On Practice Pad 5 in. A portable and practical pad for short warm-ups or a full workout. 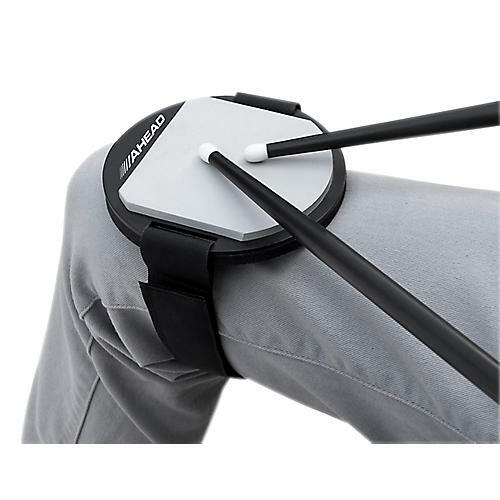 The Strap-On Pad from Ahead was developed to offer drummers and instructors a more portable alternative to conventional practice pads as well as a reduced-volume, practice instrument for drumset, concert and marching drumming. Featuring a top-quality, gum rubber playing surface that provides a natural feel, the pad's stick response and controlled volume lets drummers and teachers focus greater attention on technical and musical development while also supporting hearing protection. The Strap-On Pad is quickly and easily secured to a player's upper leg using Velcro straps; eliminating the need for stands or table-top surfaces while accommodating both traditional and matched grip. In this convenient position the pad can be used for pre-show warm-ups, daily work-outs, lessons or solo and sectional rehearsals at home, in the studio and on the road. Practice made perfect. Pick it up today!